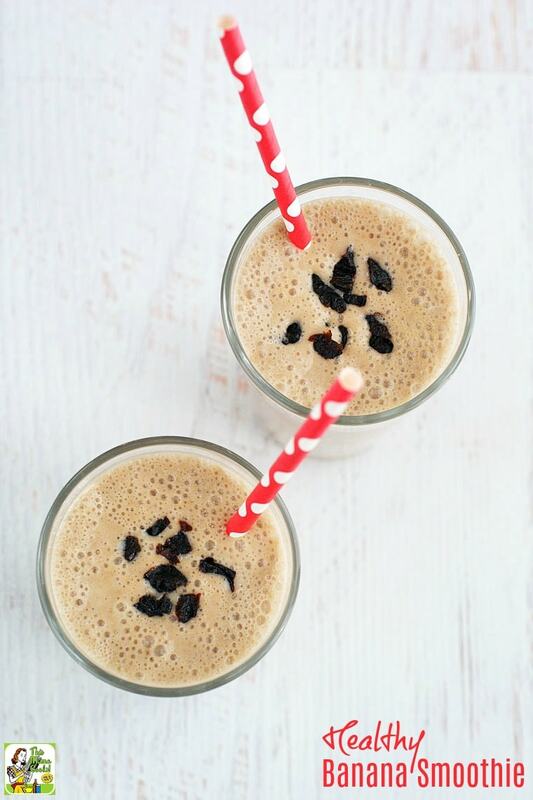 Prunes are great way to sweeten up the smoothie and sneak in some natural fiber. I love making banana smoothies for breakfast since they’re one of the easiest ways to get out of the house quickly. I make them so my teens can sip them in the car in a shaker bottle on their way to school. This banana smoothie recipe is allergen free for most people since it doesn’t use cow’s milk or peanut butter. This Healthy Banana Smoothie does take a bit of preplanning. So you don’t have to thicken the smoothies with yogurt or (ick!) ice cream, I poured the light plum juice (I used Sunsweet PlumSmart Light) into a couple of ice cube trays. Then I popped out the frozen juice cubes and stored them in ziplock baggies for the smoothies. Unlike frozen fruit, the juice cubes quickly break up in your healthy blender smoothies in no time. The extra benefit is that the frozen light plum juice thickens up your smoothies without adding too many extra calories. I used unsweetened coconut milk because it’s thick and creamy and perfect if you’re dairy free. Feel free to use your favorite alternative milk. 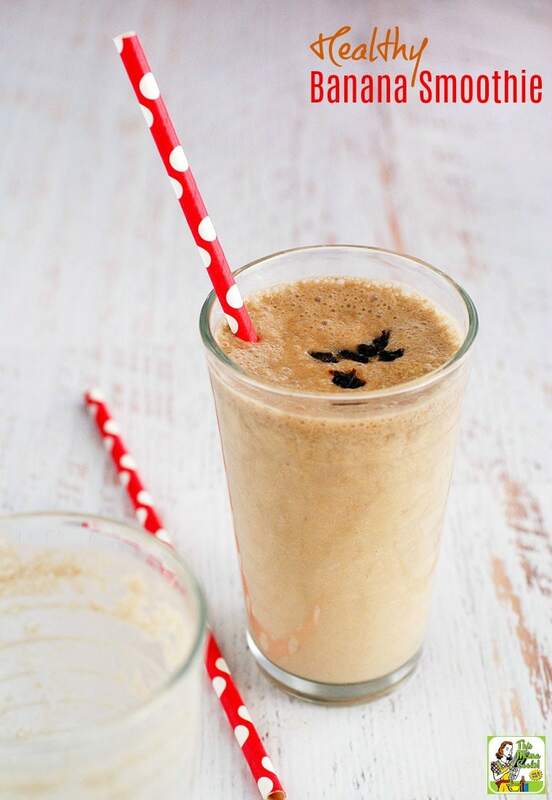 Almond milk is terrific in healthy smoothie recipes. I also used sunflower butter since we’re a nut-free family, but you can use your favorite nut butter instead. Finally, you can add dairy free protein powder (I love Orgain) for an extra nutritional boost. 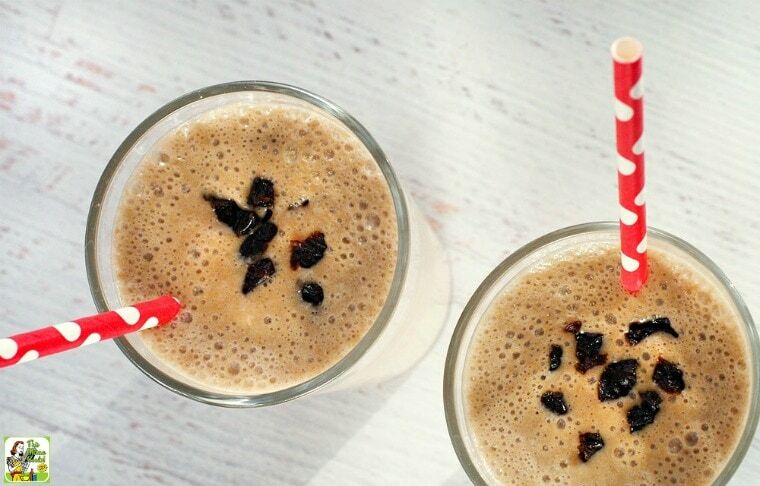 Making healthy banana smoothies is easy with bananas and prunes! Prunes are naturally a good source of fiber and since they have a low glycemic index, they keep you feeling fuller longer. You can use prunes in baking and stews or for sprinkling on oatmeal, cereal, yogurt, salads, and even on top of a Healthy Banana Smoothie! Prunes promote healthy bones because of the nutrients they contain, such as vitamin K, potassium, copper and boron. Bananas are also a terrific source of fiber and a good source of vitamin B6 manganese, vitamin C, potassium, dietary fiber, potassium, biotin, and copper. A diet containing foods with fiber contributes to heart health. Fiber also helps maintain a consistent digestive tract, which helps lead to improved digestive health. 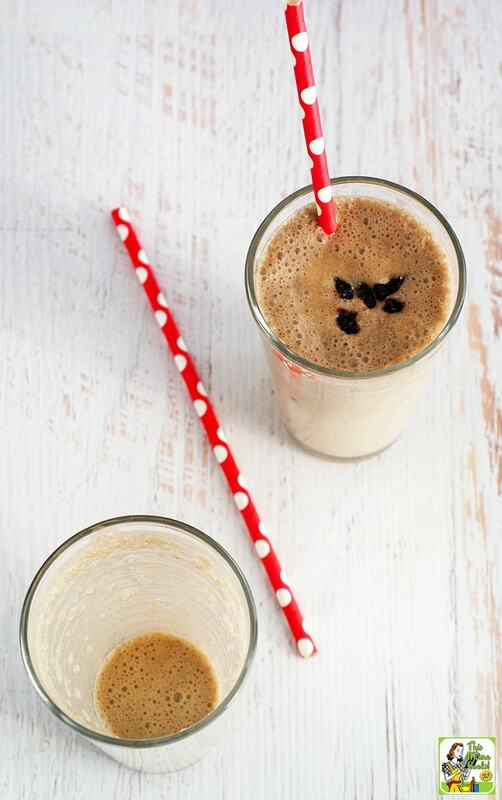 Love healthy smoothie recipes? Rev up your day with an Oatmeal Smoothies Recipe, a Coffee Breakfast Smoothie or a Berry Smoothie. Make juice cubes at least 24 hours in advance by pouring juice into ice cube trays and freezing. Remove cubes from trays and store in a ziplock baggie in freezer. Place frozen Sunsweet PlumSmart Light juice cubes, coconut milk, banana, and sunflower butter in a blender. Blend on high until the ice cubes are pulverized and the smoothie is frothy. Pour smoothie into 2 glasses. Sprinkle diced prunes on top of smoothies and serve immediately. Originally published on January 28, 2015 and September 8, 2017. Updated with new information. Posted in Breakfast, Gluten Free, Recipes and tagged dairy free, fruit, smoothie recipes, vegan on February 15, 2018 by Anne-Marie Nichols. Ok I did not know you are a nut-free household or that you are personally dairy-free. Kudos for juggling the ins and outs of eating with restrictions with such delicious and healthy results. I love the idea of having Plum Smart on hand to juice up my smoothies! Thank you for the introduction. Nut free, gluten free, dairy free – it’s a sort of pain, but we’ve got it down to a science. I love the natural sweetness of prunes and can imagine that they would work really well with the coconut milk. I have a feeling your kids will be giving up the junk food in no time, with smoothies like this in the house.